How far away was the hospital? When would Port Agent reappear? Was this man trustworthy? I recognised some of the landscape from my previous visits to Noumea- an Art Deco church, a gated mansion, a park. Everything looked so different by night. As the hospital grounds came into view my anxious nerves settled. Patrick drove us into the emergency waiting room and began conversing with the receptionist in French. He asked me; “May she see your passports?” Of course. “You’re her mother? Why has she a different name?” I’m traveling under my maiden name. “What are your insurance details?” “The cashier’s office is closed now. You won’t be able to pay cash.” Okay, I’ll pay in the morning. Rosie was admitted and Patrick left. I looked around the waiting room to locate a power source. My phone was on 56% battery and I was planning to contact Optus to arrange international roaming, so that I could make necessary calls. The power points didn’t fit my charger. Crap. At this time I stopped taking photos in an effort to conserve my battery life, aware that our stay would exceed my 56%. Port Agent showed up then. He sat down with me and waited for the doctor to call us. I asked him about the phone charger and he dug around in his backpack, then produced an adaptor. He said I could borrow it for the stay, but probably wouldn’t see him again, so I was to give it to Patrick next time he drove me. Next Rosie was assessed, and then taken to the ward. Port Agent disappeared into the night. On shift were five or six nurses, and only one could speak English. Her long hair, black eyeliner, dangly earrings and french accent reminded me of my brother’s partner, and I felt reassured by her kindness. Her name was Virginie. Virginie and the nurses removed Rosie’s line from her foot, and gave her another one. They offered her gas to calm her down but it made her vomit again. She had no other symptoms. No fever. They tested her blood again. As Virginie inserted a new line into her inner elbow, she suggested I take off my top and breastfeed baby for comfort. This made the world of difference and calmed Rosie enough for her to stay still. 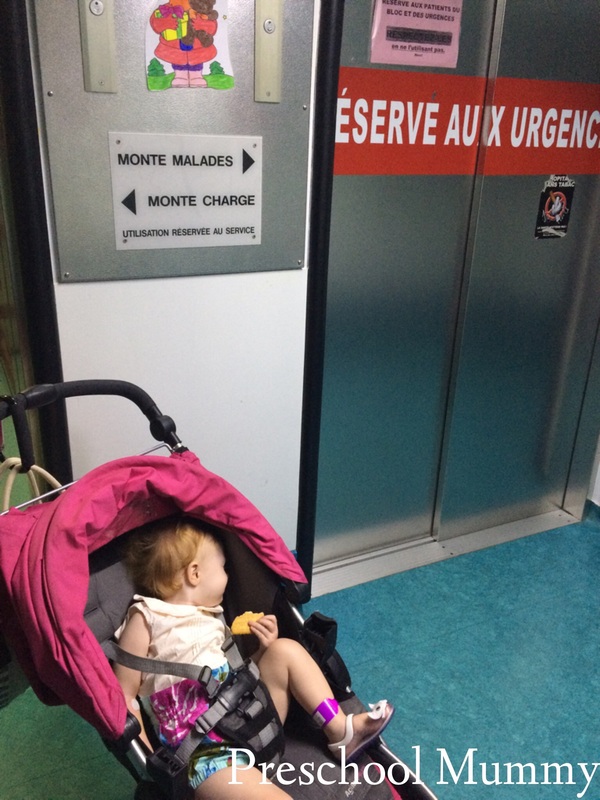 Virginie took us to a cot on the ward. Another mother was sleeping upright in a chair, her sick baby sleeping in the cot beside her. I put Rosie to sleep and then went out to the nurses common area, to try and find a way to reach out. I hadn’t eaten anything since 11am, and was thirsty. It was now 11pm. I was feeling dehydrated myself from feeding Rosie. Virginie tracked down some food for me, it was a container of plain pasta shells, a sachet of salt and a packet of butter, along with some water. Optus no longer offers international roaming to New Caledonia. I tried to log on to Facebook to contact my husband, as he could use the ship’s Internet to log on. No luck, as the hospital computers won’t allow Facebook access. I tried to log on to hotmail to contact him, but was blocked as being a suspicious login from a foreign country, and advised to reset my password through text message on my phone, which wasn’t connected. I felt helpless and isolated. Virginie helped me make a call to P and O in Australia. To make any calls, they had to go through an operator, who only spoke French. Also, calls to hotlines (like 1800 or 13-prefixes) or Australian mobiles were blocked. I think we tried about a dozen numbers with no luck. I was desperate for a bathroom and to freshen up. 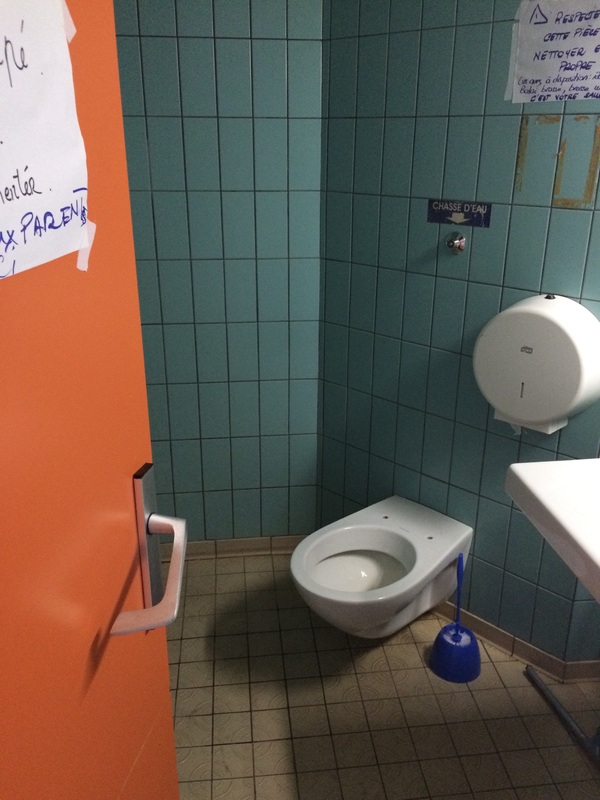 I was shown to the parents’ toilet- a broken loo, a sodden floor, no lock on the door, and a shower in the corner. Shared by all parents, men and women, about fifty families I thought. It was isolated, all the way up an abandoned wing of the floor. I hated making trips there. I gave up and went to bed. There were five or six babies in our area of the hospital, some with mums sleeping beside them in chairs, some with no-one. Rosie was still being sick between bouts of sleep. Babies were crying, in pain and distress. I was dirty and hot. There was no air conditioning. At 4am the sunlight came through the curtain-less windows, waking us. The baby in the cot beside Rosie was a beautiful little dolly called Victoria, 14 months also. The nurses handed over to the new shift and the nurse I was introduced to was Jessica, who spoke English fairly well. I enquired about a drink vending machine. I had a small amount of South Pacific francs and needed cold water. The male nurse said there was a vending machine downstairs but it wasn’t stocked. Breakfast time arrived. We were served a plain bread roll and a bowl of black tea, and we ate with the other patients and mums in a hot little room. Most of the nurses couldn’t remember our names but I knew they were talking about us when I heard Le Maman Australien, because I was now the Australian mum. At 7.30 Jessica came in to do Rosie’s obs and told me that the head paediatrician was doing her rounds and would see us soon. In came Dr Emilie, at about 9.30, most beautiful woman I have probably ever seen. She spoke so beautifully and had the most lovely manner. She examined Rosie and told me she was ordering an ultrasound of her tummy and an x-Ray. Then she broke some terrible news to me. She said that the hospital hasn’t heard anything at all from my insurance company. Without a claim initiated it would be impossible for us to leave. Port Agent had told me he was going to start my claim last night! Hot and humid but receiving wonderful care at CHT Magenta. I had to wait for Rosie to fall asleep before attempting to call out to Australia to my insurance company. 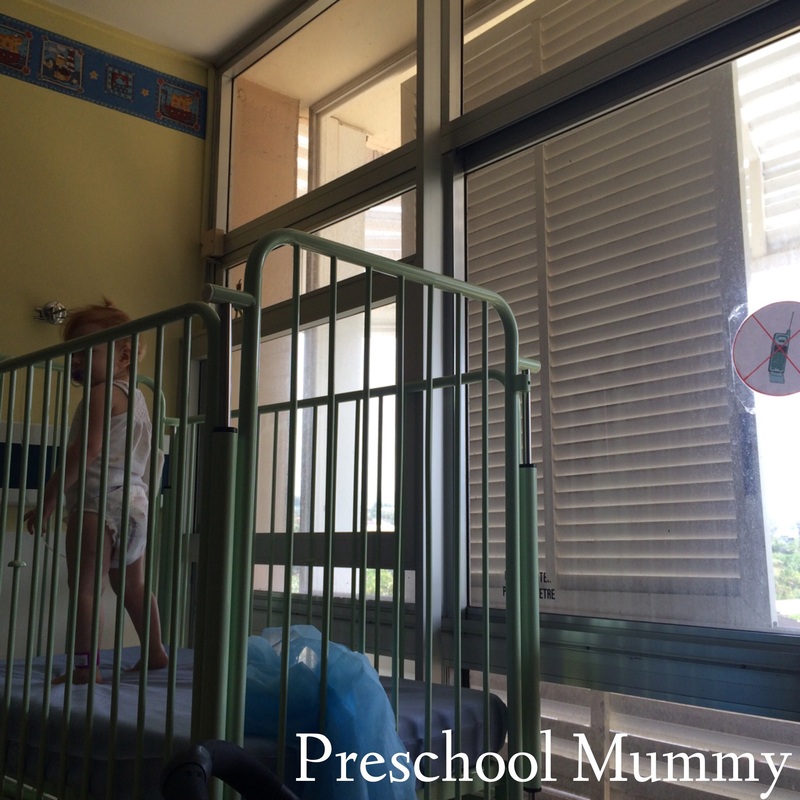 She was immobile as she was connected to the drip and had to stay in her cot. When she dozed I found Jessica and she helped me call Medibank Private Travel insurance and spoke with a man who could only be described as a total jerk. He said no claim had been initiated. He said that he’d never heard of a Port Agent. He said it could take between three days and two weeks for my claim to be looked at. Once again I explained to him that I was in a foreign country and needed immediate help in order for my child to be treated and discharged. He rudely put me through to their emergency overseas assistance centre where a lovely woman named Louisa, who did know about Port Agents and the urgency of sick babies traveling overseas, helped me launch my claim. Louisa said that nothing has arrived from Port Agent and asked for his number to call him. Rosie had her scans downstairs and to my relief they showed no blockages or problems. The doctor was perplexed. Saying she’s not seen a case of vertigo quite so severe. She ordered more blood tests. I explained that I had managed to get hold of my insurer. She was so gentle and kind, and offered me her personal mobile phone to use Facebook, which I knew my husband could access on the ship. It took me ages to write a simple message because the French keyboard and predictive text were difficult to use. 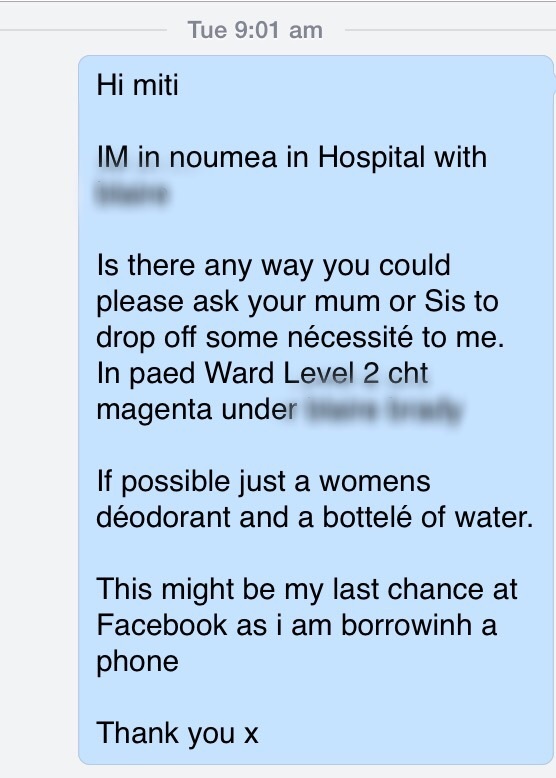 I also managed to message my brother’s partner to request some simple items be brought in by her lovely sister. It’s lucky she speaks French. Finally I got hold of the Port Agent. I asked him about the travel insurance and he said “Oh I sent off an email about you guys this morning”. I later discovered he had emailed the wrong address. Lunch had been served while we were at the x Ray section downstairs so I missed out. I was starving. A nurse Isabelle who spoke English a little came to find me, I had a phone call. I’d had two calls during the day from the ship, one from Luke and one from Mum. Due to the satellite delay it was hard to talk to them. But this wasn’t either. It was P and O care, calling to see if I needed anything. I told the lady that I desperately needed more clothes for both of us. Rosie’s clothes, several sets, had been soiled with sicky, and so had mine. I only had a pair of shorts which were unwearable and a pair of jeans I had worn in the night, which now we’re overheating me on the sweltering tropical heat and no air conditioning. She was a bit surprised there was absolutely no washing facilities but then, most of the Australians I was talking didn’t really understand how basic the hospital was. She took down our sizes and said she’d contact Port Agent to collect some new clothes for us. By this stage, our clothes and my pram were growing black mould. Five minutes later, I was called to the communal phone again. It was Port Agent calling. He said “I can’t go to buy you clothes at the moment, I will send Patrick and he will pick you up and take you shopping”. 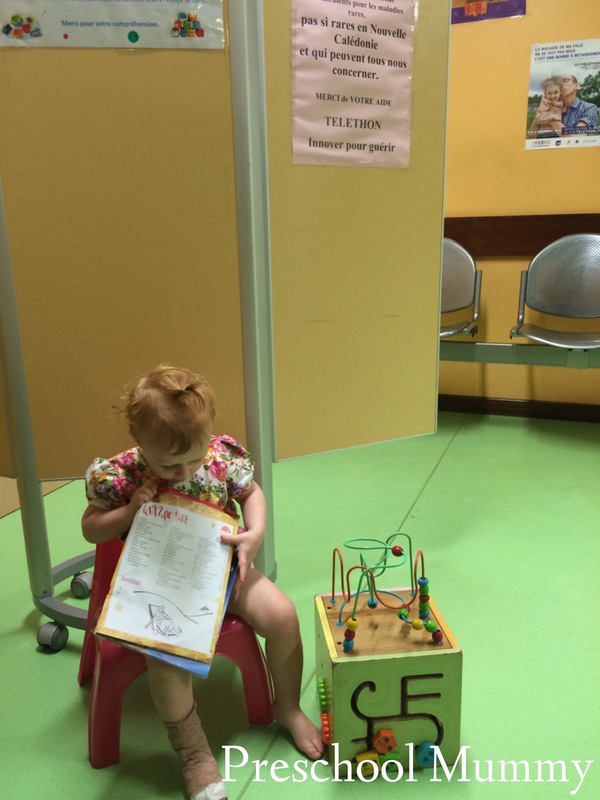 I told him I needed to wait to see Dr Emilie on her 5pm rounds to find out what the next steps were for Rosie’s treatment, and that I wasn’t able to leave the hospital. He suggested Patrick would take me shopping in the morning. In the meanwhile I hand washed our clothes in the baby bath. I hung them up to dry but the nurse asked me to take them down and gave me a plastic bag. I was waiting for Medibank to call me back. I was sitting in the hallway at about 3pm when I saw two familiar faces coming to me; my brother’s girlfriend had sent me two angels. Her mum and sister came with bags and bags of bottled water, deodorant, face spray mist and fruit and biscuits. I was so happy to see them. They stayed with us for half an hour and then went, saying they’d return (which they did, in the evening, with clothes for Rosie and books and activities.) Their visit lifted my spirit but they were about to come crashing down. At 6.30 Dr Emilie visited us. Rosie hadn’t been sick in eight hours, and she said that one more night of observation and we would be discharged in the morning. I asked her if she thought a flight tomorrow would be possible. She said she had been talking to Port Agent. I couldn’t believe this part; this senior doctor at a busy hospital, who is managing very sick baby patients, had been given the run-around by Port Agent also. He had left his number for her to call him. She did, advising him that we would be discharged in the morning and would like him to arrange our flights. He phoned back soon later, saying that as business hours had finished (everything closes at 4pm in Noumea), the travel agent wasn’t contactable and although there was a flight to Vanuatu on Wednesday morning which would place me back to meet my ship and family, there was nothing he could do to book me on it. Also, he said, flights directly to Brisbane and Sydney were booked out for at least the next three days. He said he would be in touch in the morning to arrange hotel accommodation for me in Noumea. Given his track record, I seriously doubt it. I kind of got the feeling Dr Emilie felt the same way.